The seminars that I run each winter cover a variety of different topics. Striped Bass, Bluefish, Bluefin Tuna, Offshore Shark Fishing, Bonefish, Trout and False Albacore are all species for which I can put together a presentation. I have been running winter seminars since 1993. I speak at small clubs and angling organizations and I also speak on the national show circuit. I feel strongly that my seminars are different than many that you may have seen in the past. I have a background in marine biology and am a science teacher which makes it possible for me to convey scientific information relevant to sport fishermen in an understandable format. I have an extensive library of aerial footage which allows me to show attendees particular areas but also to teach people how to read and fish waters around the world. 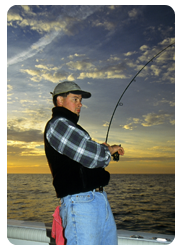 Structure fishing, flats and marsh and estuarine techniques are all covered in detail. I also have a unique video incorporating underwater shots of bass, blues and sharks. This video is simply amazing. To see sharks swim by the boat, turn, grab the fly and go crazy is an awe-inspiring sight. The video serves as a short introduction to the slide show. I also have excellent shots of shark fishing with fly rods, a sport guaranteed to capture peoples interest. I prefer to do presentations of about 1-2 hours. Less than this is usually not adequate to cover all that I like to include. I use slides, and occasionally a short promotional video. Seminar attendees are usually pretty excited about walking away from a quality seminar such as this with a lot of useful information. Call or email me for dates and topics that are currently available. My fees are reasonable and the shows are extremely enjoyable. References are readily available.